Undeniable elegance. 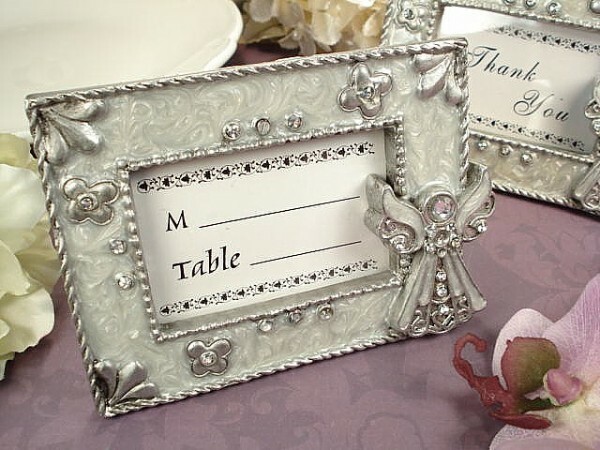 This will be the feeling when your guests receive this beautiful white epoxy accented angel dual function place card frame. Wonderfully handcrafted, the delightfully unique antique feel design and clear rhinestone accents give a true sense of flair and make this an ideal favor for practically any occasion. Can be used as a place card holder or a picture frame. Comes packaged in a simple white box. Place card and "Thank you" insert included. Another quality favor by D’Lusso Designs. Measures: 4.5"W x 3.5"H Weight: 0.3 lbs.